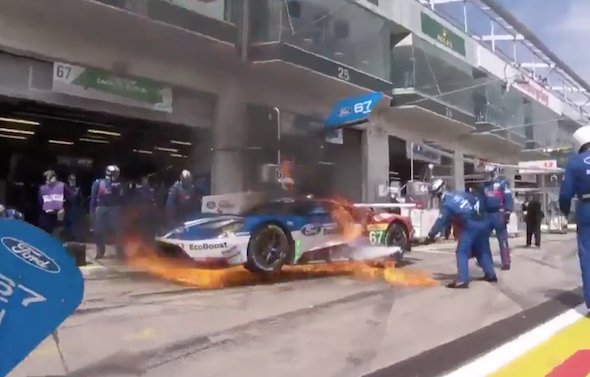 An endurance racing driver managed to escape unharmed after his Ford GT burst into flames during a bungled pit stop. The incident occurred yesterday at the 6 Hours of Nurburgring round of the World Endurance Championship in Germany. Andy Priaulx was behind the wheel of the car as it pulled into the pits to refuel. Unfortunately, a spillage occurred and ignited on the hot exhaust. Flames erupted along the side of the GT as the Ford Chip Ganassi Team's crew scrambled for fire extinguishers. The fire then began to enter the cockpit, causing Priaulx to open the door and jump through the flames to escape. Fortunately, the British racing driver escaped unharmed. The pit crew were soon joined by fire officials, who helped douse the flames. Incredibly, the car was wheeled into the garage and after 23 minutes of cleaning and repair jobs it re-entered the track at the back of the field. It finished 29th out of 33 cars.